Sales representatives know full well that email signatures are not to be taken lightly. In fact, those short parts of everyday conversations might become the key to success. With the right sales email signature, every sent email becomes an opportunity. It would be a shame not to grab this chance, so let us see how to make the most of it. This is a quite attractive email signature. Let us look at why it works. One of the most important things about email signature appearance is its colors. And when thinking about colors, you have to remember that they must stay in harmony. Even the most beautiful shades will not do on their own. This sales email signature template represents a very good combination – red, black and toned down bronze. Thanks to that, the email signature is looks both interesting and professional. Although the horizontal banner is a nice looking element, it is really a place to put your own promotional banner (unless you are a lumberjack, or work in wood industry, then feel free to use this template “as is”). Remember though, that changing the banner might require changing some of the font colors, so that they are as appealing to the eye as in the example. Promotional banners with special offers and discounts are a great way to make the most of your campaigns. What is more, as signatures appear on the bottom of the sent emails, they do not overwhelm the content, even when they are eye-catching. 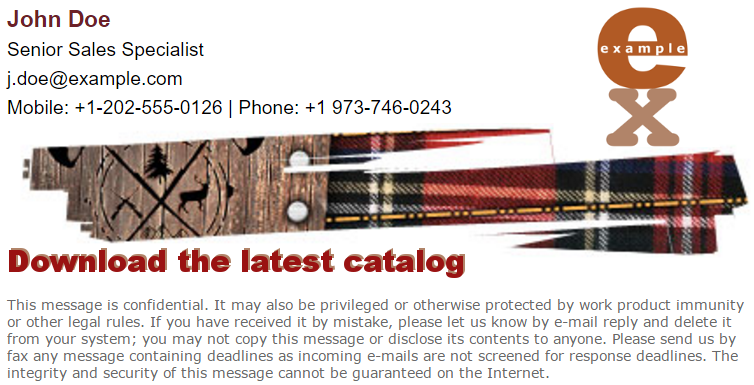 Email signature for sales representative might encourage to do various actions, in this case, the button redirects to the catalog with the newest offer. Other good ideas include linking to video presentation, order form, or testimonials. You have probably noticed that there are no social media links in this signature. This is because the banner should link to your website, where a lot of space for interesting content is. People are more likely to follow/share when their attention is grabbed with a good article or an offer they like. What is more, this template offers quite a lot of space for branding. If you link your company’s logo with your main website, you can make the signature more compact by removing the text link, which is originally in the template. In organizations, where there are plenty of departments with different priorities and needs, email signatures need to be versatile. A sales email signature needs a different setup than the one for IT, or HR department. At the same time, keeping similar layout or corporate colors is a very effective branding policy. If you want to learn more on how to ensure good branding in email signatures, go to this site. If you want to make managing signatures throughout a company a breeze, you should try CodeTwo software. It gives the opportunity to easily design and deploy as many signature templates as you desire. CodeTwo email signatures solutions enable you to add various email signatures for different departments, giving each employee the email signature they will love. You can find central signature management solutions for different platforms, so feel free to browse for what suits you best. This entry was posted in Design, Tips and tagged business email signature, email signature guidelines, tips on January 18, 2017 by Adam the 32-bit Aardvark.